An early nineteenth century American book peddler, itinerant preacher and author, "Parson" Mason Locke Weems is best known today as the source of some of the most beloved if apocryphal stories about George Washington. 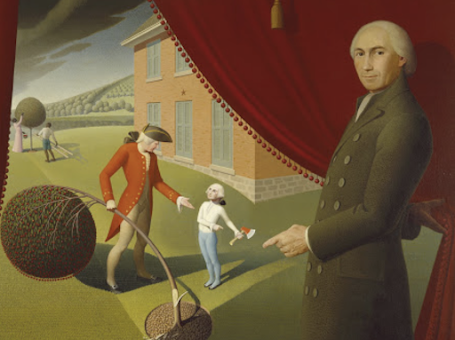 The famous story of George and the Cherry Tree is included in Weems' masterpiece, The Life and Memorable Actions of Washington, which was originally published in 1800 (the year after Washington's death) and was an immediate best-seller. Reprinted in ever more inventive editions over the next 25 years, it contains, according to Edward Lengel, "some of the most beloved lies of American history, including the cherry tree myth" and other exaggerated or invented anecdotes that extolled Washington’s virtues and provided an entertaining and morally instructive tale for the young republic. "When George was about six years old, he was made the wealthy master of a hatchet of which, like most little boys, he was immoderately fond, and was constantly going about chopping everything that came in his way. One day, in the garden, where he often amused himself hacking his mother's pea-sticks, he unluckily tried the edge of his hatchet on the body of a beautiful young English cherry-tree, which he barked so terribly, that I don't believe the tree ever got the better of it. The next morning, [George’s father], finding out what had befallen his tree, which, by the by, was a great favorite, came into the house, and with much warmth asked for the mischievous author, declaring at the same time, that he would not have taken five guineas for his tree. Nobody could tell him anything about it. Presently George and his hatchet made their appearance. "George," said his father, "do you know who killed that beautiful little cherry-tree yonder in the garden?" This was a tough question; and George staggered under it for a moment; but quickly recovered himself: and looking at his father, with the sweet face of youth brightened with the inexpressible charm of all-conquering truth, he bravely cried out, "I can't tell a lie, Pa; you know I can't tell a lie. I did cut it with my hatchet." Although plausible enough, historians generally agree that this quaint story is almost certainly not true. 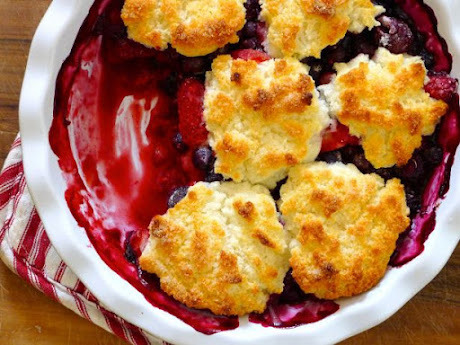 What is true, however, is that George was particularly fond of cherries, and Martha Washington's Booke of Cookery contains several family “receipts” for preserving this sweet and tangy highly versatile fruit. In the workbowl of a food processor, combine the flour, sugar, cornmeal and salt. Pulse to combine. Add the butter, toss carefully with your hands to coat the butter cubes in flour. Pulse in the food processor several times until the mixture resembles coarse oatmeal. Add the egg and 2 tablespoons of milk, cream or water, and pulse until the dough begins to come together in a ball. Add the additional tablespoon of liquid if needed until the dough comes together. Transfer the dough to a lightly floured work surface and knead it briefly to shape it into a disk about 5 inches across. Wrap in plastic and refrigerate at least 1 hour or overnight. Using a lightly floured rolling pin, roll the dough into a shape a ½ inch wider than the tart pan you are using. Loosely fold the dough in half and transfer it to the tart pan. Line the pan with the dough, being. Trim any excess dough from the rim of the pan, leaving a blunt neat edge. Gather the trimmings into a ball (it should be about the size of a pingpong ball). Wrap the tart and the ball of dough in plastic and refrigerate for 1 hour. Heat to 375 degrees. Remove tart pan from refrigerator and spread the marmalade evenly over the crust. Grate the chilled ball of pastry onto the filling, and sprinkle the almonds over the top. Bake until the pastry is golden, the filling is bubbly and the almonds are toasted, 40 minutes. Transfer to a wire rack to cool. When the tart is completely cool, dust with confectioners' sugar. Serve at room temperature.